Awesome design...minus the cat ears. 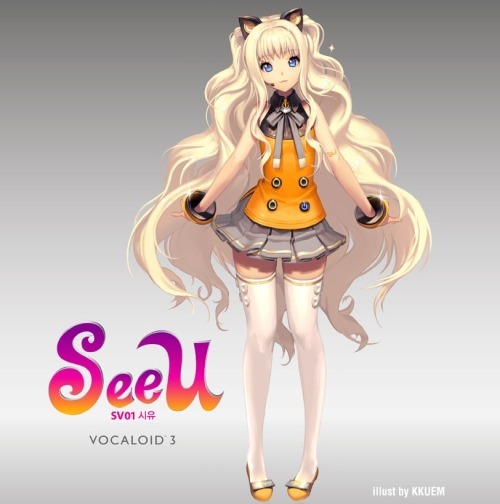 So we all know that Korean company SBS Artech was planning to release a voicebank called “SeeU” through Yamaha in late September of 2011. This week the leak of a sample song called “Fantasy” from the new Vocaloid 3 project surfaced all over the web, especially on YouTube. *And if you don’t know what a vocaloid is, just click on the link and google Miku Hatsune when you’re done. I was pretty excited after seeing the Miku Hatsune (Vocaloid 2) concert performance this year at AX. It was creepy since it was realistically solid for a projection and moved with such cute force on a live concert stage as opposed to the Toyota commercials I’ve seen her in. So I had high hopes for the future of the upcoming releases, especially the K-POP version. I actually think I prefer SeeU to Miku being as this upgraded version has a more realistic voice than the ultra high pitch squeak that so many Japanese nerd boys drool over. The song chosen for SeeU was originally a Japanese pop song redone with Korean lyrics. The deeper octave voice lends a stronger resemblence to that of a real person than a computerized machine. The software “Vocalistener” will also be included in the library, which adjust parameters for more natural singing or “a natural synthesized voice”. Plans are to have both the main editing software and the vocal library be sold separately and to be distributed in Korean, Chinese, Spanish, and English. Yamaha also plans to release licensing of plug-ins and use of the software for other media such as video games. Also to be released is a male Vocaloid 3 by PowerFix with a price tag of $129 for Oct 2011. Voicebanks are ready, although no new news has been further released.